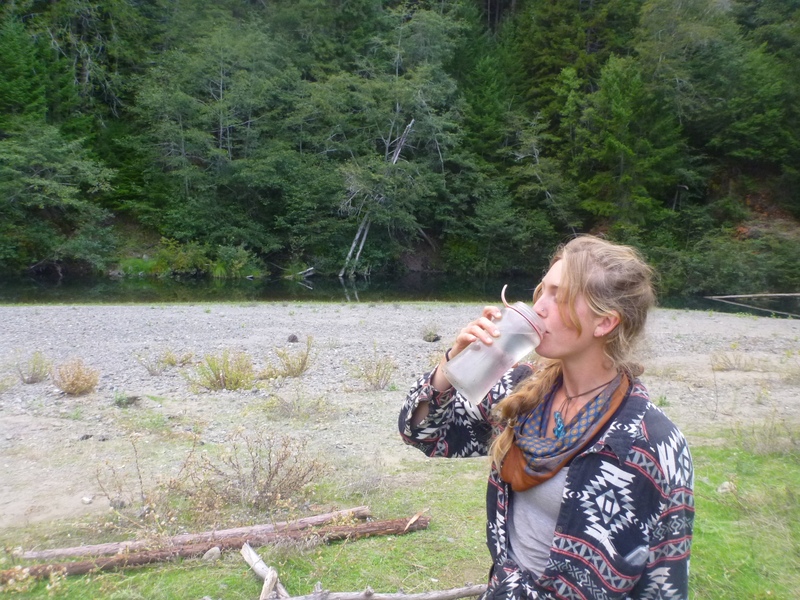 15 October – 9pm – Navarro River Camp. I had wanted to start this journey on Columbus Day, and indeed, that’s when we finally managed to pull up stakes at the Apple Farm, but tonight we’re in our tent for the first time. We’ve entered unknown territory. Packed and out of the Apple Farm at 1:15pm. T said “see ya on the news.” Over the bridge the gate was open onto the Cheesecake Road. 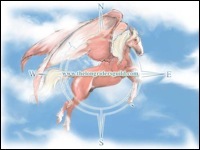 Gryph sang “we sailed away on a winter’s day, with fates as malleable as clay” (joanna newsom). It’s true. The ponies are tied to trees for the night; high and not too long to keep them from getting tangled in their ropes. They grazed two+ hours as we set up camp, cooked and ate Onions, Beets, Patty Pan Squash, Tofu, Chevre and fresh Ginger. We have entirely too much food. It’s good food. 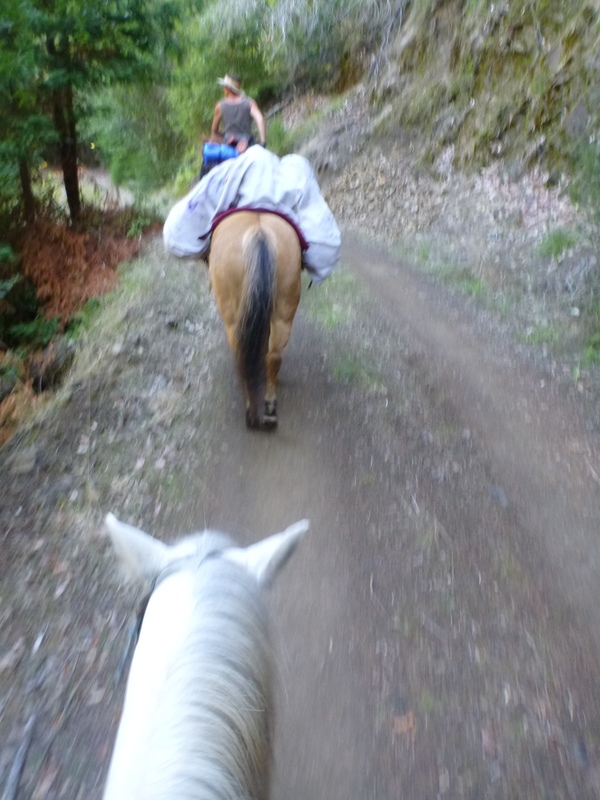 Crossed the Navarro River repeatedly today – generally rocky and shallow, but one crossing was chest deep on Vaca Suerte who led the way bravely with Gryph aboard. Jesse James and i led Finehorn, happy that all our gear is packed in dry bags. The canvas tarp covering our gear is a reclaimed bit off Gryph’s artwork, painted as a tablecloth for Thanksgiving dinner last year in Boulder, used to wrap my massage table for the trip west, hung in the teepee for the summer – Finehorn wears it well. 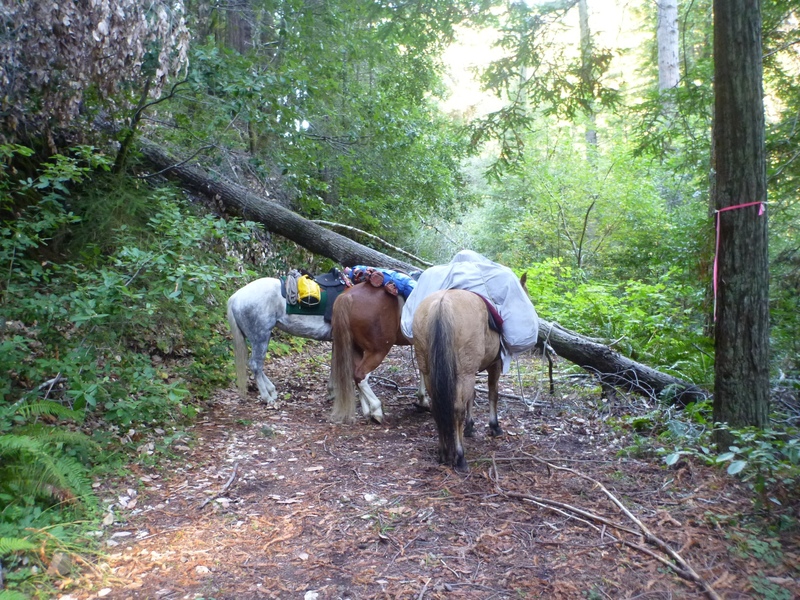 For the most part the horses have been sleeping since it got dark and we tied them to the trees. Now they have woken up and are restless. I went out to check on them and they each whickered to me in turn. This will take some getting used to – for all of us. The woods are Loud! Frogs and crickets and owls and birds we can’t identify. 16. Oct. – 7:30p – Cape Horn Campsite. 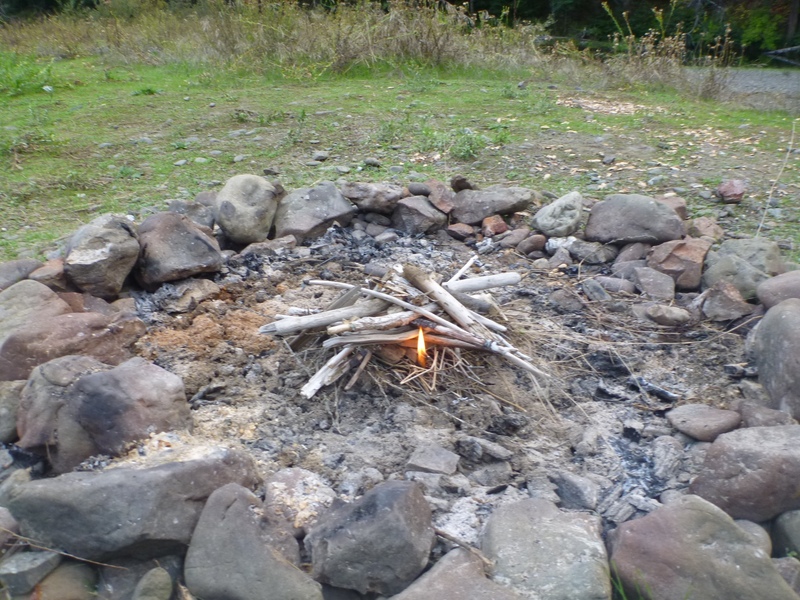 Found a fire ring and wood, considered it tacit permission and made a campfire to cook the last of the spuds for dinner (w/ carrots, onions, cheese and sardines. 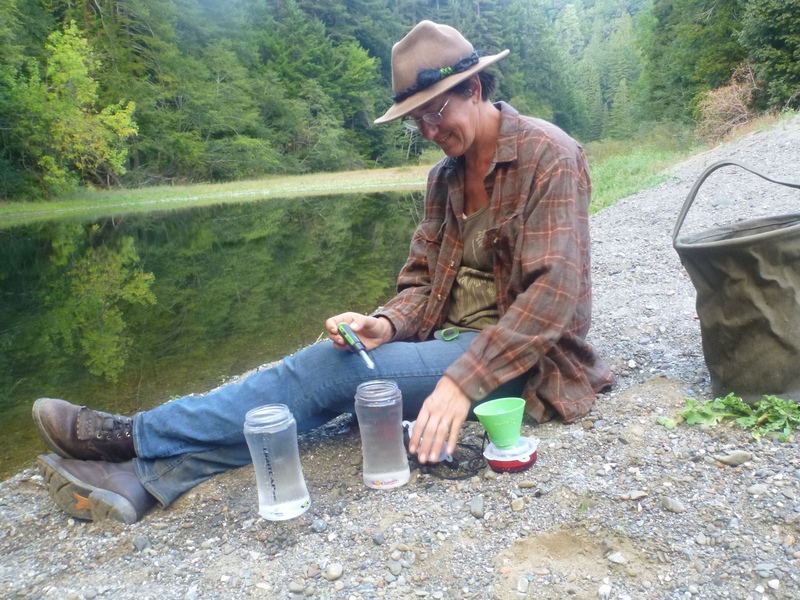 Morning took too long – didn’t get moving ’til 1:15 again – then had to find the way across the river and onto the logging road – then we realized we’d lost a water bottle back @ the last stop so Jesse and i went back while Gryph stayed with the mares. Finehorn’s pack not as well balanced today as yesterday when S was helping us. We realized we needed to redo from scratch about the time we found Cape Horn and called it a day at about 4pm. I’m grumpy with the stress and the rope burns on my right hand that even with gloves on hurts when Finehorn tugs the rope (stopping to eat, for example, which is frequent.) Part of the stress is the newness – nothing is routine (except grooming the horses) – we have 12 hours of daylight and it takes 5 hours to get rolling and 3 hours to get camp set up – not much time to make forward progress and then when the way is not clear more time is lost. Part of my issue is that people are expecting us in specific places @ specific times and we’re totally out of cell ‘phone reception so no way to keep anyone posted. 2 days into the trip and we’re 2/5 of the way to the ocean. We are obviously in no way capable of being on a schedule @ this point – and need to stop trying. Tonight the mares are tied close to one another from overhead branches and Jesse is on his 30′ tether. It’s a risk, but will make his life much more comfortable if he can cope. Finehorn is getting better with the tether, Vaca Suerte not so much. We let her graze freely this evening, dragging a 6′ rope – she didn’t stray too far from the herd. At least that lets her graze without constant attention (and too frequent tanglings). Tried out our Steripen Adventurer water purifier device for the first time this evening. Very SciFi – a little scary – i understand that the science is sound, but it’s a leap of faith for sure. It’s certainly small and light and easy! 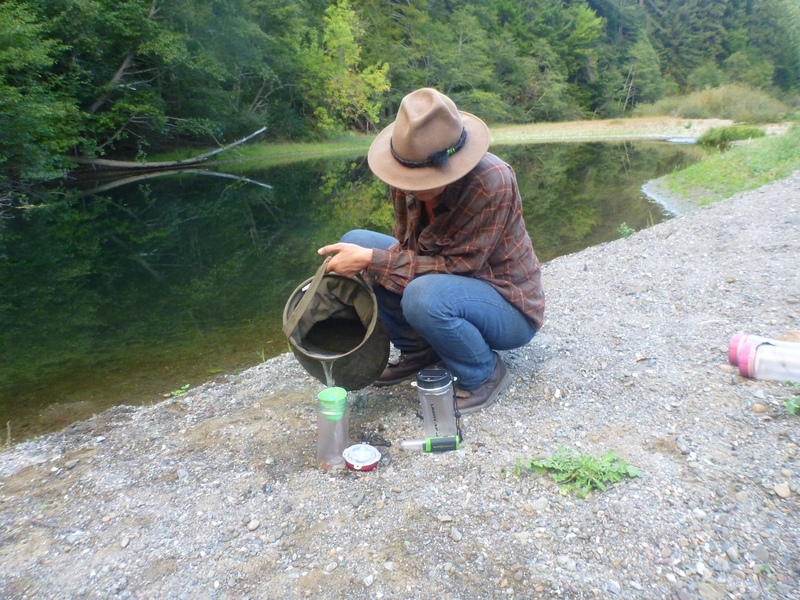 Funny to be using Old School collapsible water buckets from Sears to gather water from the river and pour it through the pre-filter into our SolLight water bottle/lanterns – where we stir with our glowing magic wand for 90 seconds to make the river water safe for humans to drink. We both feel burdened by the amount of Stuff we’re toting around. I’m sure the ponies share that sentiment. What can we get rid of and still have what we need? 17. Oct – up just past 7am – misty morning and the ponies are as we left them – beautiful spot on the river and a temptation to linger but we’re pushing our luck re: weather -> time to roll. 8:20pm – not yet to Paul Dimmick Campground but I can hear occasional traffic from our camp. A gorgeous day of riding in terms of scenery but rough in every other way. Finehorn’s pack kept slipping to starboard and we kept stopping and trying to reset it, tighten the diamond hitch, start from scratch – annoying, time consuming and unsatisfying as we never could fix the problem. Wondering if the tree is unsymmetrical or is it just a packing problem? Finehorn is being astoundingly patient about it all – tolerant and still willing. Vaca Suerte is treating Gryph like a passenger and there is little time/energy to devote to working with Gryph on her riding – while riding Jesse, ponying Finehorn, finding trail, backtracking and trying another way around or through, resetting the packs, tightening the ropes, getting off and on for various reasons, trying to sort the maps, etc. Tonight I blew up at Gryph for not sorting dinner. I had just done an emergency dismount and gotten dragged down the rocky river-shore trying to hang on to Jesse James when the mares got away from her and bolted past Jesse and I (we’d gone back to scout for a campsite) and he started to run with them – back towards home down a rocky, tree strewn river bank. Finehorn lost the tent and Vaca lost her saddle pad (!?!) – which we retrieved – but otherwise we came out of it ok. Jesse stopped before i let go – i led him back to find the mares who’d hit a dead end of fallen trees and started to return, both saddles seriously askew. i am achy from the fall, with bruised ribs and sore right arm and shoulder. I have asked Gryph to find some part of this trip that she can take charge of so i don’t have to feel like it’s all my responsibility to pay attention to everything – it seems that given her skill set, Quartermaster/Cook is the logical part to assume responsibility for – ideally down to planning and provisioning. We are both stretched almost beyond our limits and I need to get over feeling like i am the one figuring it all out. She’s fully capable of doing that part of things, and has been doing most of it in reality, I just need to mentally hand it over. It’s frustrating to work and try and push so hard and only be making 5-6 miles of actual progress a day. The MRC permit is only good for 6 more days and @ this rate we’re still 6 days from the ocean! 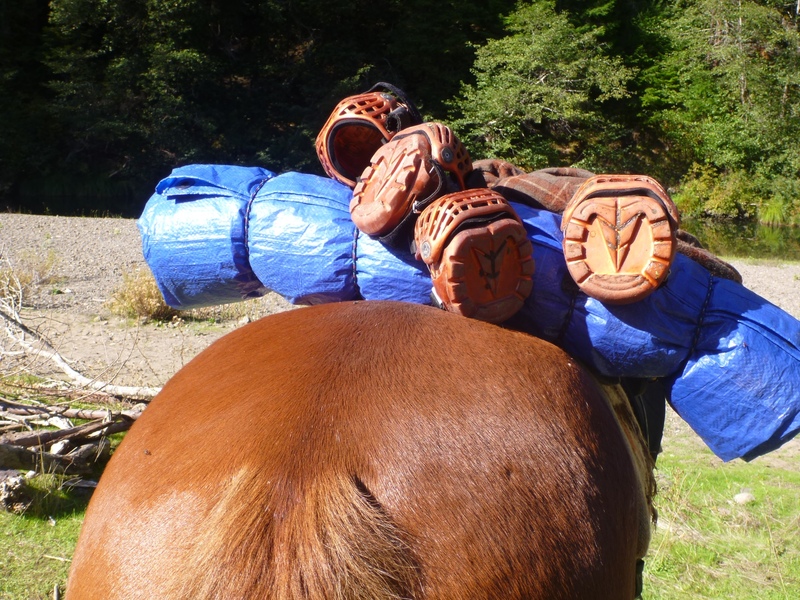 We must find a way to balance Finehorn’s pack – and get going faster in the mornings. This morning took 4 1/2 hours (down 1/2 hour ;-)) which is still bloody ridiculous. Evenings are less worrisome as we can finish up after dark – but the horses need graze time. This entry was posted in Uncategorized and tagged Adventurer, Cape Horn, Columbus Day, dry bags, emergency dismount, joanna newsom, MRC permit, Navarro River, SolLight, Steripen, tethering. Bookmark the permalink. I am SO excited to follow your journey my friends. The first time I met you was when you stayed with me in the Caribbean on your way from boat to boat. And now I am buying a boat and you are on horseback!!!! Life is just so beautiful!